What exactly is narcissism? An incurable disease set to ruin your future, a habit to be curbed, or a trait to be nurtured? And how can you tell if your partner, child, or even you are a narcissist? Dr Craig Malkin offers a new picture of narcissism, showing us why being called a 'narcissist' isn't necessarily such a bad thing after all. 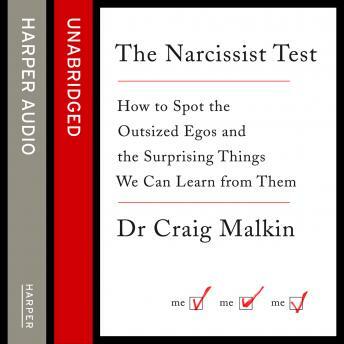 As supportive as it is illuminating, The Narcissist Test is the first and only book to distinguish between healthy and unhealthy narcissism, and offers clear, step-by-step guidance on how to promote the healthy kind in your partner, children, and in yourself. From advice tailored to parents, social media users and even schools, this is the definitive text to help you overcome the bad - and embrace the good - about feeling special.